Troy Darnell Vincent was born June 8, 1970 in Trenton. He grew up in the troubled Wilbur section of East Trenton. As a teenager, he recalls having played in basektball games sponsored by rival drug dealers in exchange for free shoes. These contests often took place in The Garden, a fenced-in basketball court in back of his house. He and his mother, Alma, lived with his grandparents. When Troy’s grades began to drop, Alma moved across the river to suburban Bucks County, Pennsylvania. Troy attended Pennsbury High School as a freshman, but the family had to move back to Trenton because of financial problems. Fortunately, Troy was able to return to Pennsbury for his junior and senior years. He lived with the family of his friend, James Bodley Jr. The Bodleys encouraged Troy to find an afterschool activity. He joined the track and football teams, and made enough of an impression to earn a scholarship to the University of Wisconsin. Troy was an impact player for the Badger varsity beginning in his freshman year as a defensive back and return man. He earned four letters in his four years with the team. As a sophomore in 1989, he led the Big Ten with a 15.1 punt return average. As a junior in 1990, he set new Wisconsin single-season and career records for passes broken up. In 1991, Troy was voted team captain and MVP. That season he was named Big Ten Defensive Player of the Year, set a school record for punt return yards, and was honored as an All-American as a senior—the school’s first since 1987. Troy was taken with the seventh pick in the 1992 NFL Draft by the Miami Dolphins. 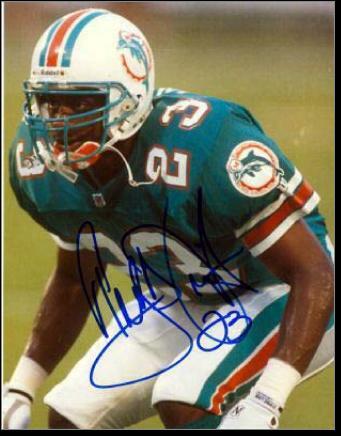 He started at left corner as a rookie and helped the Dolphins reach the AFC Championship Game. Miami had a winning record in each of Troy’s four seasons with the team, and made the playoffs three times. During that time, he intercepted 14 passes and ranked among the team leaders in tackles. Troy’s career took off after he signed with the Eagles as a free agent in 1996. He was picked to play in the Pro Bowl each year from 1999 to 2003, and was named First-Team All-Pro in 2002. In 1999, Troy tied for the NFL lead in interceptions with 7. In 2001, the Eagles won the NFC East and made it to the NFC Championship Game. They lost to the Rams 29–24, denying Troy his last shot at a Super Bowl. Ironically, in 2004, the year he left the Eagles to play with the Bills, Philly finally made it to the Super Bowl. Troy finished his career with the Bills and Redskins, and retired after the 2006 seasons with 51 career interceptions. He made 28 of those picks in a Philadelphia uniform, which ranked sixth all-time when he left the club. Troy’s leadership and success on the field earned the respect of his fellow players, as well as new players coming into the league. He often spoke at league-held seminars on the importance of sound financial planning and preparing for life after football. Troy was also president of the NFL Players Association. In addition to his various business interests, he has served as VP of the NFL Player Engagement Organization. In this role he continues to help support players and their families, and speaks at rookie symposiums. Troy still frequents his old neighborhood, visiting with longtime friends and hounding teens to finish school and get off the street. The city even wanted to rename The Garden after him, for his generous donations to the park’s upkeep. Instead it was named after Jefferson Vincent, in memory of his grandfather.